Wage floors have continued climbing and are higher and more widespread now, with 10 major cities, seven states, and dozens of other local governments passing laws to boost minimum wages to between $12 and $15 an hour in the coming years, eventually covering more than a fifth of the U.S. workforce. On average across the six cities studied, “a 10 percent increase in the minimum wage increases earnings in the food services industry between 1.3 and 2.5 percent,” the researchers found. The Berkeley team said in a news release that their study “casts further doubt” on the 2017 findings of University of Washington researchers that Seattle’s minimum wage increase led to fewer hours and jobs for low-wage workers. Jacob Vigdor, the Daniel J. Evans professor of public policy and governance who leads research on the Seattle minimum wage at the UW, has his own criticisms of Berkeley’s approach. Vigdor agrees with the Berkeley study’s findings; his own group duplicated them using its own methodology and data. But he said the focus on just one slice of the economy – the food-service industry – may miss the bigger picture as minimum wages rise. Looking at Seattle’s low-wage labor market as a whole, defined as workers paid up to $19 an hour, Vigdor’s group found an overall 3 percent increase in wages associated with the minimum wage increase that took effect in 2016, but a roughly 9 percent decrease in total hours worked – resulting in an aggregate decrease in paychecks. The Berkeley research also understates winners and losers within the food-service industry as restaurants adjust their business models to rising wages, he said, citing changes such as asking customers to fetch their own food from the counter rather than delivering it to a table. 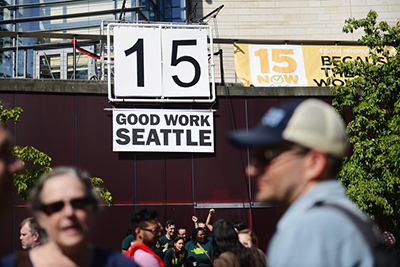 Part of the UW team’s research – under a contract with the city of Seattle – involves repeated interviews with Seattle workers and business owners about their reactions to the rising minimum wage. “The experienced worker with a really great track record, working for at least a couple of years, they can write their own ticket in this economy,” Vigdor said, pointing to a relative shortage of low-wage workers who have been driven out of the city by rising housing prices and the cost of living in general. Those just entering the job market, meanwhile, are finding employers less willing to take a chance on them at a higher mandated starting wage, he said. Vigdor’s research has been criticized for inadequately separating the impact of the minimum wage increase from the broader economic boom. While he defends the methodology for doing so, he also said that other dynamics in Seattle’s local economy would have driven up wages here anyway, and that Berkeley’s analysis suffers from the same flaws. Allegretto points to comparisons her team made between the six cities and other metropolitan areas where there was no minimum wage increase, including Dallas, Denver and Philadelphia “that have also seen rapid private sector growth in the past several years.” This and other aspects of the study design “gave us confidence that our findings are indeed due to these cities’ minimum wage increases,” she said. Seattle’s minimum wage, effective Jan. 1, is $15.45 for companies with 501 or more employees, or $15 an hour if the company also offers paid medical benefits. For smaller employers, the wage floor is $14 an hour, which can also include medical benefits and tips. The city’s Office of Labor Standards is due to announce large employer minimum wage increases for 2019, tied to the local consumer price index, by the end of this month. Washington’s statewide hourly minimum wage of $11.50 – the highest in the nation, except for Washington D.C. at $13.25 – is set to increase to $12 and $13.50 in 2019 and 2020, adjusting for inflation each year thereafter. The statewide wage increase, Vigdor said, will further complicate efforts to assess the impact of Seattle’s increasing minimum wage because his team’s methodology relies on comparing the labor market in Seattle to other areas in the state that did not have similar increases in the minimum wage.